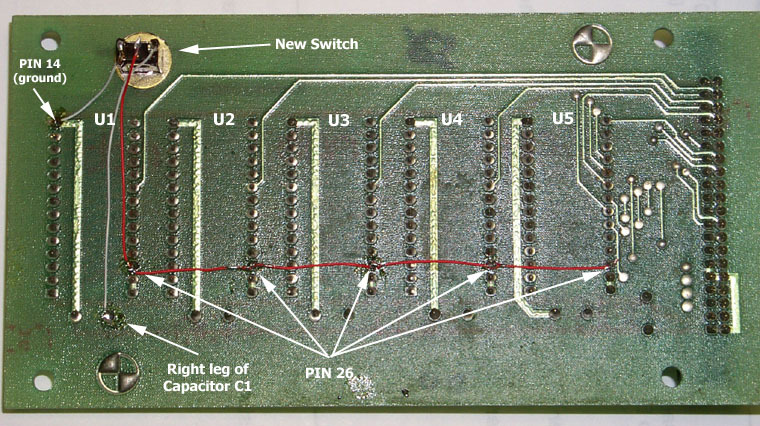 The modification described on this page (which allows you to change between Dragon's Lair and Space Ace ROMs with the flip of a switch) requires you to physically alter your original hardware. A non-invasive alternative has since been developed. Consider keeping your ROM card in its original physical condition and installing the Merlin MultiROM Board instead. Merlin offers quick on-screen switching between the ROMs for Dragon's Lair, Space Ace, and also Dragon's Lair II: Time Warp. Additionally, if you choose to do so, Merlin allows you to upgrade your laserdisc player to a newer, more reliable model. Merlin also lets you use the joystick to select a Space Ace skill level when you start a game, if you do not have a Space Ace control panel with the 3 skill level buttons mounted on it. 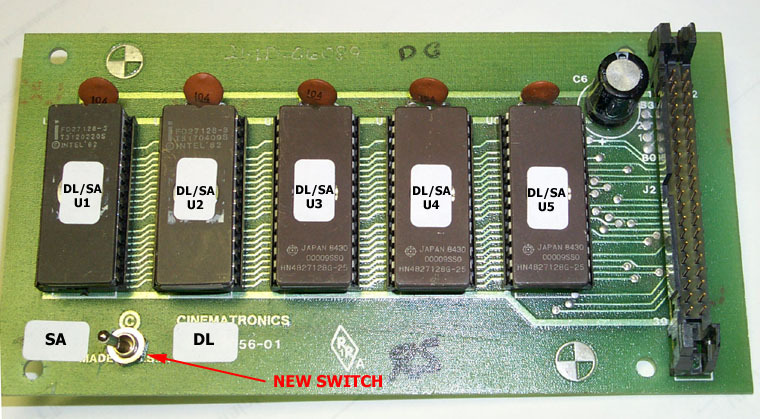 The Dragon's Lair / Space Ace Combo is another innovative game enhancement brought to you by the D-L-P. Now you can easily change EPROMs between Dragon's Lair and Space Ace with the flip of a switch. This document will show you the steps necessary to make your own Dragon's Lair / Space Ace Combo game.  Special Combo ROM images - See download section. The existing Space Ace DIP switch settings have been remapped to match more closely with Dragon's Lair. This allows a person to easily change from Dragon's Lair to Space Ace (or vice versa) while retaining all their favorite settings, like free play, amount of lives, attract mode audio, etc. Also, all three skill level selections (CADET, CAPTAIN, SPACE ACE) have been added. Now you can set your skill level for Space Ace via DIP switch!! This comes in extremely handy if you are playing Space Ace in your Dragon's Lair machine which does not have the skill level buttons. As stated above, all of the existing Space Ace DIP switch settings have been remapped. Please refer to this new Dragon's Lair / Space Ace DIP switch settings chart for use with the Dragon's Lair / Space Ace Combo ROM images. VERY IMPORTANT!!!!! If you create the new Dragon's Lair / Space Ace Combo EPROMs for another person to use, you must provide that person with a printout of the new Combo DIP switch settings. Thank you!! Dragon's Lair and Space Ace use type 2764 EPROMs which hold 8,192 bytes each. A 27128 EPROM holds 16,384 bytes. By using a 27128 chip, we can fit both sets of data onto one chip. We then use a switch to toggle A13 (address 13 line) to force the chip into two halves (upper and lower). 2^ 13 equals 8,192, so with A13 "ON", the chip read address starts at 8192. With A13 "OFF", the chip read address starts at 0. To put this in a game perspective, putting the switch in the "OFF" position would give you Dragon's Lair and the "ON" position would give you Space Ace. Take your wrapping wire and measure it out to fit from pin 26 (address A13) on U5 to the other side of the ROM board at Pin 26 on U1. On the solder side of the ROM board, carefully solder the wrapping wire at each pin 26 location. Next, solder a small piece of wire to pin 14 (ground) on U1, and solder another small piece of wire to the right leg of capacitor C1. NOTE: Be very careful when soldering this wire across each pin 26. You can cause damage to your ROM board or Main Logic Board if solder gets on any of the neighboring pins. Choose a location for the switch. Solder the wire coming from Pin 14 (ground) to the left leg of the switch. Next, solder the wire coming from the right leg of capacitor C1 to the right leg of the switch. Lastly, solder the wire coming from the pin 26s to the center leg of the switch. Take five blank 27128 EPROMs, and program them with the Combo ROM images (U1 thru U5) found in the Download section. Insert your disc, set your new switch for the proper game (it's a good idea to label the switch positions), set your DIP switches, and start up your game. When you decide to change games, power down, change your disc, and flip the switch. With a simple DOS command, you can easily combine any 2 ROM sets that you'd like to use with this hardware modification! Using the North American versions of the Dragon's Lair and/or Space Ace (original or Enhancement) ROM sets that are available at this site, over 200 different ROM set combinations are possible. This will create a new file, Combo_U1.bin that can be burned onto the first 27128 EPROM. Then repeat that command for all the remaining ROM images U2 through U5. If one game has more ROMs than the other, such as if one has 5, and the other has 4, then just make sure that that game's 5th ROM image gets burned onto the same half of the 27128 EPROM as its others, and then the other half of that EPROM can either be left alone, or filled with "FF"s, or even filled with tasty recipes! ROM images for Dragon's Lair and Space Ace can be found in the Tech Center. The user is solely responsible for any and all adverse effects resulting from the use or misuse of the information described above, the ROM data, or the EPROMs it is stored on.